If you typically have to take a few vehicles to an event, an SUV may be the answer. With seating for five or more, an SUV holds more people so it saves gas and everyone gets to travel together. 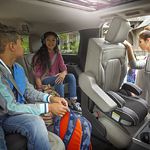 An SUV with a good entertainment package is ideal for long trips with younger passengers. Some people prefer a truck because of its ability to tow heavy things. Many SUVs can tow heavy loads and accommodate more passengers and cargo inside the vehicle. Unlike a truck, cargo is stored inside the SUV, so it is better protected from the weather.